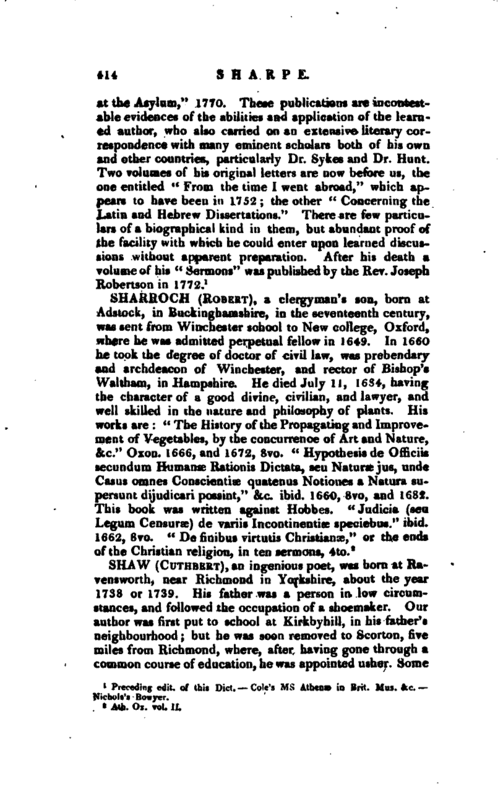 , an ingenious poet, was born at Ravensworth, near Richmond in Yorkshire, about the year 1738 or 1739. His father was a person in low circumstances, and followed the occupation of a shoemaker. Our author was first put to school at Kirkbyhill, in his father’s neighbourhood; but he was soon removed to Scorton, five miles from Richmond, where, after having gone through a common course of education, he was appointed usher. Some | lime after he became usher to the grammar-school at Darlington under Mr. Metcalf, and while there published his first poem, in 1756, called “Liberty. Humbly inscribed to the Right Hon. 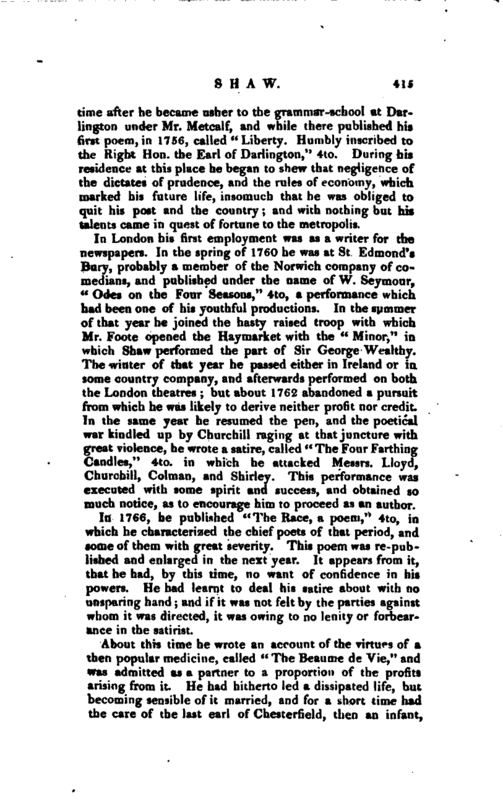 the Earl of Darlington,” 4to. During his residence at this place he began to shew that negligence of the dictates of prudence, and the rules of economy, which marked his future life, insomuch that he was obliged to quit his post and the country; and with nothing but his talents came in quest of fortune to the metropolis. In London his first employment was as a writer for the newspapers. In the spring of 1760 he was at St. Edmond’s Bury, probably a member of the Norwich company of comedians, and published under the name of W. Seymour, “Odes on the Four Seasons,” 4to, a performance which had been one of his youthful productions. In the summer of that year he joined the hasty raised troop with which Mr. Foote opened the Hay market with the “Minor,” in. which Shaw performed the part of Sir George Wealthy. The winter of that year he passed either in Ireland or in some country company, and afterwards performed on both the London theatres; but about 1762 abandoned a pursuit from which he was likely to derive neither profit nor credit. In the same year he resumed the pen, and the poetical war kindled up by Churchill raging at that juncture with great violence, he wrote a satire, called cc The Four Farthing Candles,“4to. in which he attacked Messrs. Lloyd, Churchill, Colman, and Shirley. This performance was executed with some spirit and success, and obtained so much notice, as to encourage him to proceed as an author. In 1766, he published” The Race, a poem," 4to, in which he characterized the chief poets of that period, and some of them with great severity. This poem was re-published and enlarged in the next year. It appears from it, that he had, by this time, no want of confidence in his powers. He had learnt to deal his satire about with no unsparing hand; and if it was not felt by the parties against whom it was directed, it was owing to no lenity or forbearance in the satirist. About this time he wrote an account of the virtues of a then popular medicine, called “The Beaume de Vie,” and was admitted as a partner to a proportion of the profits arising from it. He had hitherto led a dissipated life, but becoming sensible of it married, and for a short time had the care of the last earl of Chesterfield, then an infant, | to instruct him in the first rudiments of literature. He also issued proposals for publishing his poems by subscription; but this was never executed, and he returned the money he had received. 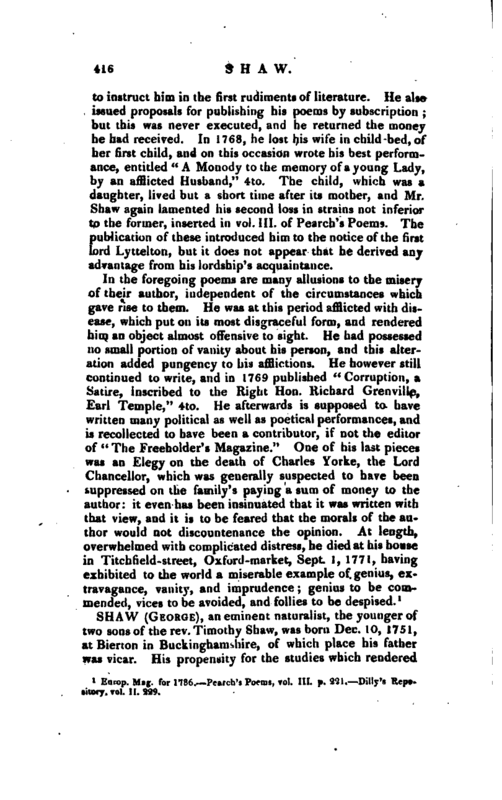 In 1768, he lost his wife in child bed, of her first child, and on this occasion wrote his best performance, entitled “A Monody to the memory of a young Lady, by an afflicted Husband,” 4to. The child, which was a daughter, lived but a short time after its, mother, and Mr. Shaw again lamented his second loss in strains not inferior to the former, inserted in vol. III. of Pearch’s Poems. The publication of these introduced him to the notice of the first lord Lyttelton, but it does not appear that he derived any advantage from his lordship’s acquaintance. Europ. Mag. for 1786. Pearch’s Poems, vol. III. p. 221. Pilly’s Repository, vol. 11. 229.